The Gran Hotel Turquesa playa was built in 1996, and is only 1 kilometre away from Puerto de la Cruz, one of the most important towns of tourism in the Canary Islands. Only 100 metres away and surrounded by beautiful flower gardens , you will find the volcanic sand beach called "Playa Jardín. The Hotel has five floors and six elevators that will take you directly to the top floor where you will have a beautiful and stunning view of the town. For all these reasons and because of the personalized service of our staff, we would like to invite you to spend an unforgettable holiday with us. The Gran Hotel Turquesa Playa has at its guests' disposal 350 bedrooms fully equipped with all the comforts of the modern life. Furthermore the hotel completes it offer with 4 swimming pools, restaurants, bar, entertainment shows and many other amenities. The hotel has at its guests' disposal 350 bedrooms that can all be used as single, double or triple depending on your needs. All our bedrooms are fully equipped with all the comforts of the modern life such as complete bathroom, multi-channel music, hairdryer, air-conditioning (in summer), direct dialling telephone, fridge, satellite TV, safety deposit box (for hire), bathrobe and terrace with terrace furniture which consists in a table and two chairs, drying-frame. In the bedrooms there is also the possibility of adding on request a cot or an extra bed. Moreover all our rooms enjoy sea, mountain or swimming pool views. Punta Brava buffet restaurant is an integral Buffet with dishes selected from local and international cuisine. Guests might find grilled meat an fish dishes every day , at dinner and grilled eggs, etc, in the breakfast service. This restaurant has limited smoking area. Here guests can enjoy their breakfast, lunch and dinner. In our Italian restaurant we also serve breakfast. The Italian Restaurant with Italian specialities. The Argentinean Restaurant which offer a great variety of meats. The Restaurant "Tasca Canaria" where you can enjoy tapas in a traditional Canarian style. In addition to this there are also available 5 Bars: Atlantida Bar with drink service, the Pool Bar with drink service, our Beer Bar where we serve soft drinks and beers, the cafeteria/ice cream where you can enjoy our great variety of ice creams, juices and tropical-shakes. 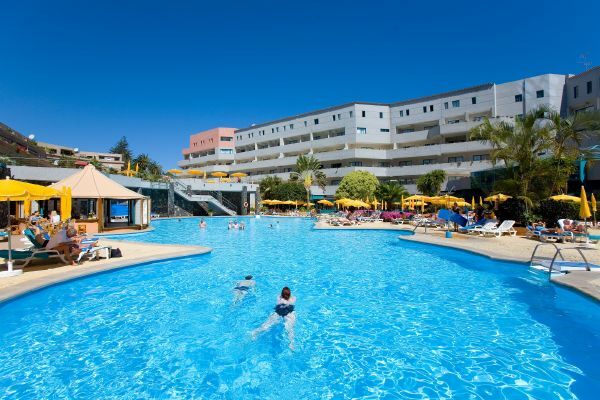 If you like sports you will be glad to know that there are available 4 swimming pools (2 of them for children), fitness centre (Sundays closed), squash (with charge), sport zone with tenis, paddle, Pitch & Putt Golf (without charge), sauna (extra charge) and mini golf. You can also enjoy: shopping area, games room, entertainment program for children, entertainment for adults, aquatic activities, children's play area, children's park with guide (ages between 4 and 12), mini-movies, mini-disco for children, children club with PC games, night entertainment with shows and theatre room. Description of the "All Inclusive 24 Hours" system: All the restaurants are available for our guests that have booked with the All-inclusive system. You need to book for the theme restaurants. Our drink offer in the bars includes national brand name drinks and standard international brands. From 10 pm till 08 am, Snacks, Sandwiches. Between 11:00am and 11:00pm, there is always one of our bars opened. Water in the mini-bars, coffee and tea service in the rooms, ice creams, juices and soft drinks for children, safety deposit box in the room. What the "All Inclusive" does not include: 24 hours medical assistance service, babysitting service, laundry and iron service, taxi service, the shopping area, car hire and excursions, external telephone calls.